1. Finely chop the cabbage and cook up bacon to get the bacon fat. 2. 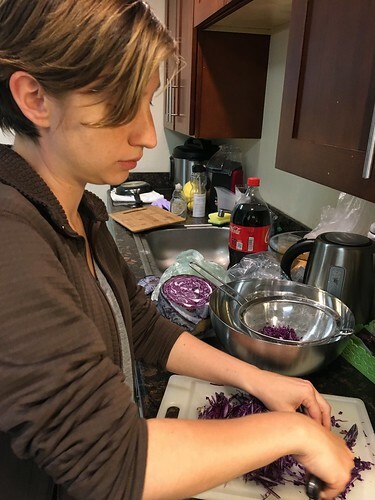 In a fine mesh colander, mix chopped cabbage with two teaspoons of the salt. 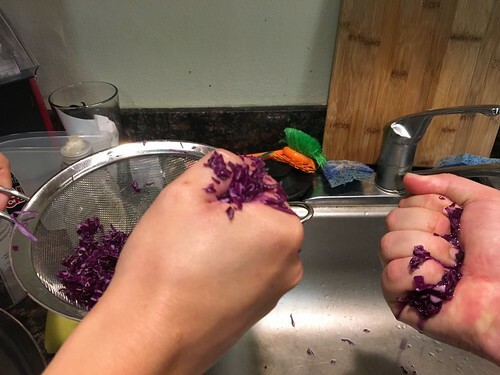 Let it stand for 10 minutes as you do other things, then grab handfuls of cabbage and squeeze them to remove the liquid! 3. 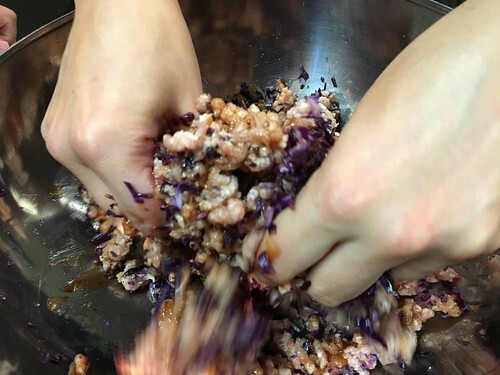 Transfer the drained cabbage to a large bowl and add the pork, bacon fat, pepper, remaining 1/4 teaspoon of salt, and a half cup of barbecue sauce… mmmm. 4. Use your hands to squish and blend it together. Stir ¼ cup water into the remaining sauce. Optional: cover and refrigerate the filling for a bit, or up to two days; it will be easier to spoon into wrappers when chilled. 5. When ready to cook, lay out a small bowl of water and wrappers. Wet a half inch around the rim of each one, scoop a fat teaspoon of the pork mix into the middle. 6. 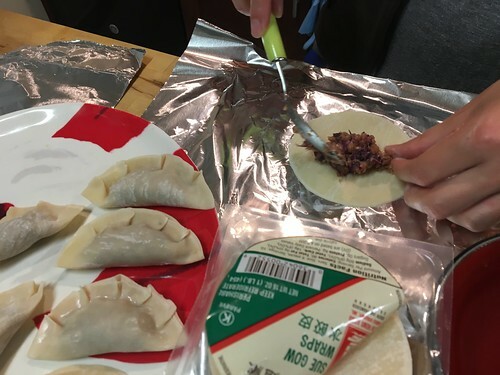 To seal each dumpling, fold the wrapper longwise, firmly pinching the edges together at the top. 7. Coat a cool non-stick skillet with 2-3 tablespoons of vegetable oil, coating pan and then some. Head to medium-high. Add dumplings in single layer so each one touches the pan. 8. Next, fry until they look golden and crispy on one side, then flip them to the other side. 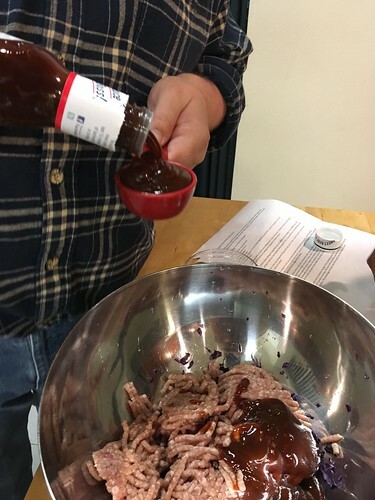 Drizzle with about 2 tablespoons of barbeque sauce. 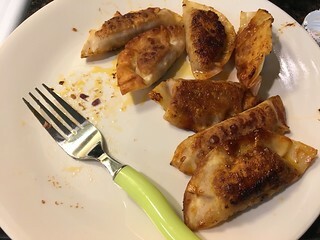 As the second side is getting crispy, flip the dumplings to coat on all sides, and let the sauce caramelize. 9. 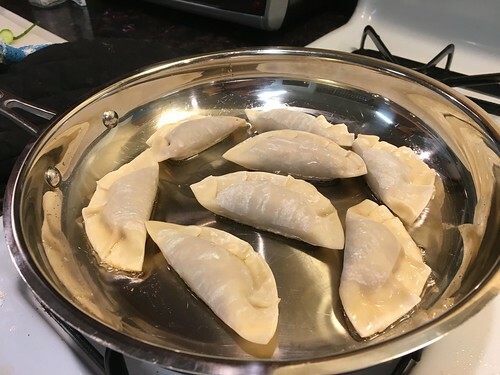 Finally, flip dumplings out of pan and serve – you can also freeze the raw assembled dumpling to serve another batch later! Modified from Kenny Lao and Genevieve Ko’s Hey There Dumpling! With an alternate cooking method from Joanna Cutrara, who writes web marketing and copy for small businesses at www.southerninkwriting.com. 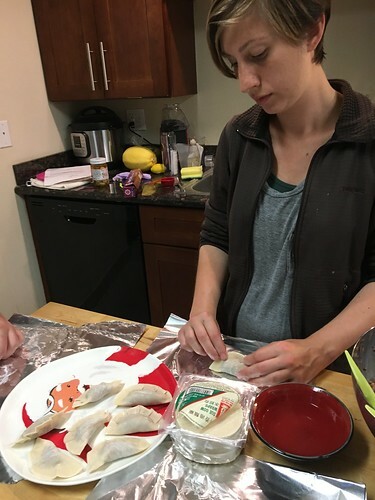 Prior dumplings we’ve made on this blog include Kazakh Manti Dumplings, Swedish Kroppkakor Dumplings, and Corned Beef and Apple Pierogis.